We own a Pacific Play Tents I See U 6' Tunnel . Our tunnel gets used quite a bit, especially on rainy days. I've even caught our cat lounging inside. 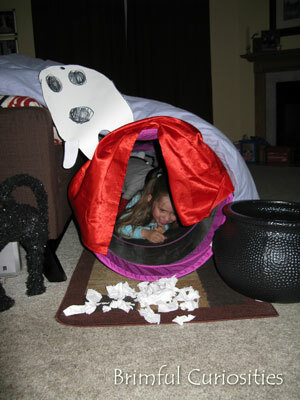 This evening while I was making supper the kids covered it with a blanket and transformed it into a haunted tunnel, complete with spooky ghosts. So creative and an entirely child-initiated activity! BOO! Cute! Our tunnel gets tons of use too! Don't you love when the kids are being creative on thier own. So cute!